Click here to watch a video of the speech. 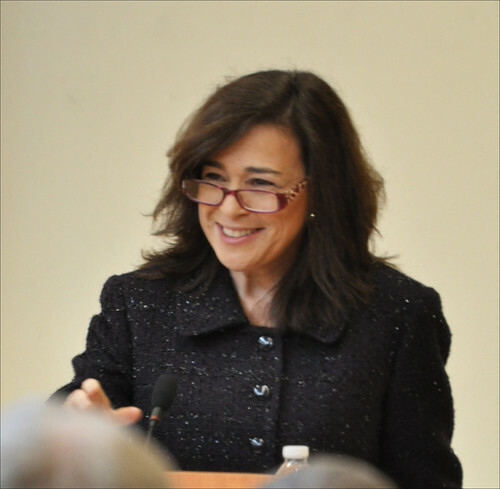 The U.S. Department of State's public diplomacy programs for countering violent extremism (CVE), which support local television programs, women and interfaith programs, now extend into social media and have shown success, said Under Secretary Tara Sonenshine during her speech, "Public Diplomacy and Countering Violent Extremism." Sonenshine spoke about the success of these public diplomacy efforts with about 100 audience members at University of Maryland during the March 27 event hosted by the National Consortium for the Study of Terrorism and Responses to Terrorism (START). She noted positive nature of these efforts, stating, "If the other side can use negative factors to lead people in one direction, then we can use positive ones to lead them in the other." She also noted the importance of using multiple tools, including social media, to prevent negative ideologies and recruitment efforts. Under her leadership, the State Department's Center for Strategic Counterterrorism Communications (CSCC) engaged on forums, Facebook, comment sections of websites and YouTube to counter extremist ideas on the Internet more than 7,000 times in the year 2012. "We cannot afford to stand on the sidelines and let cynical voices distort and misreport our policies, values and interests," Sonenshine said. "We have to enter that communications space where so many young people are getting their information and contest extremist and other negative rhetoric with facts and counter assertions." Sonenshine acknowledged that that nearly 90 percent of the world's population younger than 30 live in developing countries and may not have access to social media, but she said she stands by the importance of using it to counter violent terrorism. "We're really in a world that is a blend of the physical and the virtual," Sonenshine said in an interview with START. "Online engagement scales up the number of people you can reach. It doesn't give you depth, but it gives you breadth." Sonenshine said the goal is not always to change the minds of the extremists, but to reach the fence-sitters and sympathizers. Members of al-Qaida responded to the CSCC's work confrontationally and urged their members to not pay attention to the CSCC's work, which Sonenshine said reflects CSCC success. She also cited a recent analysis in Afghanistan that found that 69 percent of people surveyed had heard the State Department's messages to counter violent extremism and 83 percent of those people said they found the messages to be effective. Sonenshine said she does not think that CVE work should be done exclusively by the State Department; she emphasized the important of the individual voice and recommended ways for young people to involve themselves in the movement to counter violent extremism. "Be curious and interested in global issues," she said. "Write [your] own commentary and thoughts about these issues . . . Use your own voice." Click here to view a transcript of the talk.